Alex’s first road trip was a success–he was extremely well-behaved for a 3-month old. He’s got the travel bug like his parents! Last Friday, we crowded into our Fiat Marea “Weekend” station wagon and began the 4 hour trip to Venice. A few times we had to stop to feed or change Alex, or just remove him for a few minutes from the confines of his car seat. Our first rest stop was an Autogrill and let me just say that their panini are better than any sandwiches in the U.S. Same goes for the coffee. Michael brought me my first cappuccino “to go” (most Italians don’t drink coffee to go–putting coffee that good in a plastic cup is practically sacrilegious) and it was surprisingly delicious. The foam was rather deflated, but it tasted better than Starbucks. Okay, almost any coffee tastes better than Starbucks. I went back to Chicago last October for a brief work visit and ordered a cappuccino just for kicks–I almost gagged on the burnt taste. But, I digress. We made it to Mestre, the last city on the mainland before Venice, by 12:30 pm and the gods were smiling at us. The forecast had been for rain, but the skies were sunny and blue. 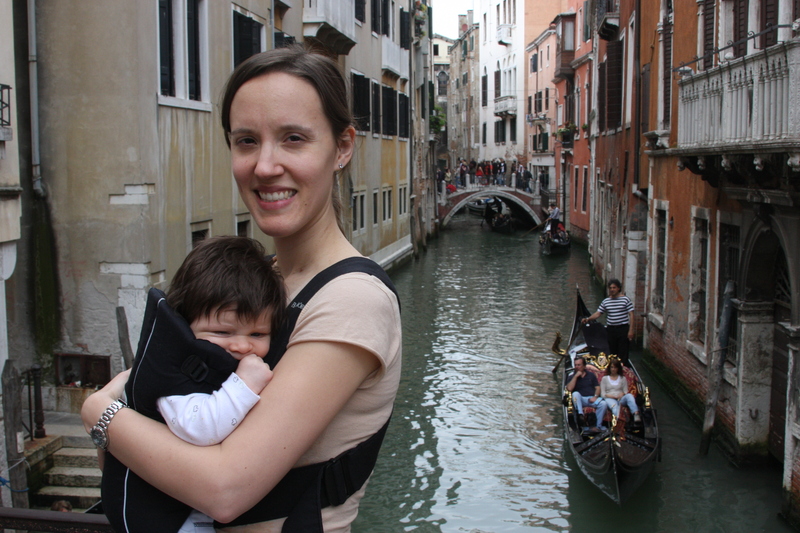 I shudder to think how difficult it would have been to tour Venice with a stroller in the rain. It’s not exactly an accessible town for babies because it’s all islands connected by bridges that are not wheelchair (or stroller) accessible. We booked a train for Santa Lucia station in the heart of Venice and were there by 1:20 pm. We decided to walk to the apartment we were renting for the night rather than pay for the traghetto that would ferry us across to the Rialto bridge. Walking through the side streets of Venice is the best way to see the city, especially since that route is less touristy–and Venice was already packed with pilgrims, tour groups, backpackers and Italian school children. Despite all our luggage, it was a pleasant walk through Venice’s crowded streets and markets; plus, Alex slept the entire way. An hour later, we were unloading our bags in our extremely well-located apartment. I popped Alex into the Baby Bjorn and we were off. For three hours, we toured Venice, stopping in Piazza San Marco, taking some obligatory photos near some gondolas, and then, following the route past St. Barnaba church (for all you Indiana Jones and the Last Crusade fans! ), crossing over the Ponte dei Pugni (the bridge of fists, where gangs used to box until the fights were outlawed in 1705) and back to the Rialto bridge. Along the way, we stopped for a drink in Rio Tera’ Canal where Michael and Rob ordered some overpriced, watered down Aperol sodas and Staci had an unfortunately sour red wine, but I lucked out with an orange Fanta. You really can’t mess that one up. That evening, we had a nice meal outside at the Osteria del Milioni, a cute little restaurant that was pretty well-priced for Venice. We all had the artichoke soup to start and tiramisu to finish. Tiramisu (meaning “pick me up” in Italian) was invented by the Venetians, but this one wasn’t the best, unfortunately. Not enough marscapone cheese and a bit too spongy. But, all in all, a pretty good way to spend a Friday! This entry was posted in cappuccinos, driving, road trip, tourists, Venice and tagged babies, backpackers, cappuccinos, panini, Piazza San Marco, road trip, tourists, Venice. Bookmark the permalink. Well behaved “for a 3 month old?” He was better behaved than most adults on a road trip. And so cute! We miss him so much…and you guys too! We love the blog; keep writing.